Nails in the Roof, Good. Nails on the Ground, Bad. Nails by the thousands. Every roof has thousands of nails securing them to the decking beneath. 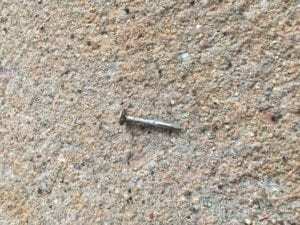 One of the most common complaints from homeowners is when they find nails around their house after getting a new roof. It’s no wonder this could happen. And roofing nails are sharp! They are just the right length to cause a real problem. They have a flat head too so they can even stand up on an end and cause a lot of damage to a tire or worse – a foot! This is a big deal to us at New Roof Plus. We are perfectionists. We prefer to clean up at the end of each day to make sure the work site is clean and safe as possible. 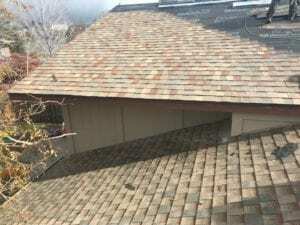 This home near Littleton CO is getting a new roof installed. As roofers work their way across the installation lines, nails are placed to secure each three tab shingle section. Roofing technology has not advanced enough to a point where a good old fashioned nail is not required. Maybe someday roofs will be installed without nails! And humans won’t have to climb up there either!